Twain Harte Rentals offers an exciting variety of vacation cabin rentals in Twain Harte, California. Nestled on the western flank of the Sierra Nevada, the small mountain community of Twain Harte is situated east of Sonora along Highway 108. Vacation cabin rentals in Twain Harte lie between the oak forest of the California foothills and the mixed pine and fir forest. Twain Harte is both a summer and winter vacation community. Twain Harte vacation cabin rentals provide access to all kinds of recreation and culture. The friendly town features destination restaurants, convenient shopping, and many services – the last before entering the forests of the high country. Charming Twain Harte and neighboring foothill towns in historic Gold Country provide welcoming activities and events. The Sierra Nevada climate offers an escape from the summer heat of the Central California valley. During the summers, days are warm and nights are mild. Winters can be very cool and it snows many times. 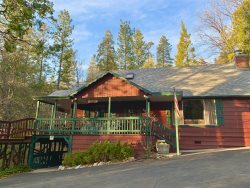 Why Choose Twain Harte Cabin Rentals? The Great Outdoors offers relaxing and invigorating activities for all ages. From wildlife and birdwatching to camping expeditions, vacationers immerse themselves in the natural environment. There are hiking and biking trails in Twain Harte and throughout the mountains. Fishing lakes and streams are also favorites. Some head out to the back country on horses while others swim at Twain Harte and Pinecrest lakes. Several venues open during snowy months. These include snow tubing at the Leland High Sierra Snow play Area near Strawberry, ice-skating at Long Barn Lodge, skiing and boarding at Dodge Ridge Ski Area near Pinecrest, and Badger Pass Ski Area in Yosemite Park. There are also numerous places for snowshoeing and cross-country skiing near vacation cabins in Twain Harte.